Five days before a 2007 article in the New England Journal of Medicine showed that the diabetes drug Avandia was linked to a 43% increase in heart attacks compared with other medications or placebos, a group of scientists and executives from the drug's maker, GlaxoSmithKline (GSK), gathered in a conference room at the offices of the Food and Drug Administration in White Oak, Md. The GSK goal: to convince regulators that the evidence that the company's $3 billion-a-year blockbuster drug caused heart problems was inconclusive. To do that, the GSK officials focused not on heart-attack data but on a broader, less well defined category of heart problems called myocardial ischemia. The most recent studies of Avandia, the GSK officials told the FDA, had "yielded information that is inconsistent with an increased risk of myocardial ischemic events," according to sealed court proceedings obtained by TIME. What GSK didn't tell the FDA was that on May 14, 2007, two days before the White Oak meeting, GSK's Global Safety Board had noted that a new assessment of Avandia studies "strengthens the [cardiac-risk] signal observed in the [previous] analysis." Or that eight days earlier, the company's head of research and development, Moncef Slaoui, had sent an e-mail to its chief medical officer saying Avandia patients showed an "increased risk of ischemic event ranging from 30% to 43%!" Or that the day before the meeting, the company had produced a preliminary draft report that showed patients on Avandia had a 46% greater likelihood of heart attack than those in a control group. But the mixed-evidence argument GSK presented to the FDA worked. After months of deliberation, the agency decided to keep the drug on the market  a move worth billions of dollars to GSK but that also may have put millions of patients at risk. Such examples of the drug industry's outmaneuvering FDA regulators are disturbingly common, say both scientists and policymakers who follow drug approval and safety monitoring. More than 140 million Americans take at least one prescription drug in any given month, and they rely on the FDA to ensure those drugs are safe. That trust, the story of Avandia illustrates, is a gamble. In July, an FDA advisory group conducted the second hearing on the drug's safety since its 1999 approval and again concluded that the evidence against the drug was insufficient to pull it from the market. The group instead recommended additional warnings and restrictions on Avandia's use. In the coming weeks, the FDA will decide whether to take that advice or withdraw Avandia from the market. Over the past two decades, as drug after drug has been recalled after winning FDA approval, it has been hard not to wonder if FDA regulators have been captured by the drug industry. FDA critics and industry monitors charge that the drug-approval process is too easy for pharmaceutical companies to game. It is in some ways an unsurprising development. The FDA serves a public insatiably hungry for new medicines. Yet the agency does not have responsibility for performing safety testing. It relies on drug companies to perform all premarket testing on drugs for safety and efficacy. And it relies on industry "user fees" for 65% of its budget for postmarket monitoring of the drugs it approves, thanks to a 1992 law designed to speed treatments to patients. "The FDA's relationship with the drug industry [is] too cozy," says Senator Chuck Grassley of Iowa. Federal studies reveal that the FDA doesn't have a complete or accurate list of prescription drugs on the market and is missing or has incomplete information on one-third of the drug-safety and efficacy trials under way. Over the past three years, the inspector general at the Department of Health and Human Services found that the FDA had inspected only 1% of clinical-trial sites from 2000 to 2005 and lacked financial disclosure data for clinical investigators in half of all industry drug reviews. The results of this broken system may prove criminal as well as fatal. In June, FDA whistle-blower Dr. David Graham published an article suggesting that Avandia caused 47,000 more diabetics to suffer heart failure, stroke or death than would have been the case if they had taken an alternative. The risk is especially troubling given that diabetics are already more vulnerable to heart disease because of their condition. 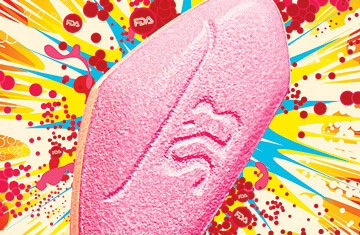 Congressional reports revealed that GSK sat on early evidence of the heart risks of its drug. Equally alarming is the revelation that the FDA knew of the dangers months before it informed the public. Now the FDA is investigating whether GSK broke the law by failing to fully inform the agency of Avandia's heart risks, deputy FDA commissioner Dr. Joshua Sharfstein tells TIME. At the least, the story of Avandia shows how drug companies use uncertainty to their advantage  at a risk to public health. In November 1998, SmithKline Beecham (SB), which more than a year later would merge with Glaxo Wellcome to become GlaxoSmithKline, presented the FDA with an impressive application to market Avandia: dozens of boxes, each containing eight volumes the size of the New York City phone book, filled with trial data and chemical analyses. Avandia, or rosiglitazone, was only the second in a new class of antidiabetes drugs that was showing promise in helping Type 2 patients keep their blood sugar in check. But the first product, troglitazone, or Rezulin, was also causing a troubling amount of liver damage, so doctors and patients were eager for a safer alternative. Aware of this, FDA officials put Avandia on a six-month fast track to approval. As the FDA's medical, statistical and pharmacological reviewers went through the mountain of documents, they soon found the same thing: Avandia users experienced more cardiovascular issues, including a rise in bad cholesterol (or LDL) and lipids, than those taking other antidiabetes medications or a placebo. But detailed though the pages of data provided by SB were, they didn't show this danger of heart problems with certainty. See pictures of art in science.